The MPC left rates unchanged. The Council maintained a neutral bias. Governor Glapiński expects no rate shifts during his term if the National Bank of Poland (NBP) projections materialise. He added that nearly all MPC members exclude the possibility of rate cuts in the coming months. There was only one dissenter in the camp (likely ultra-dove E.Łon). Moderate hawk Ł.Hardt stated only that forward guidance should not cover the period of the whole term due to increased uncertainty. The MPC presented a positive assessment of the fiscal impulse - during the press conference, the NBP governor stated it shouldn’t lead to economic imbalances. The NBP published a new projection. 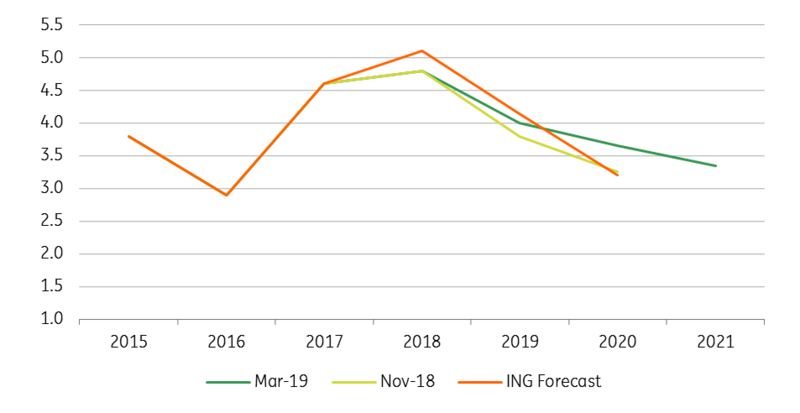 The CPI forecast for 2019 was lowered from 3.2% to 1.7% year on year (YoY) on lower assumptions regarding energy prices and likely core inflation. The CPI forecast for 2020 was also reduced from 2.9% to 2.7% YoY, slightly above our forecast (2.6%). The NBP published new estimates for 2021 – the central trajectory is expected close to the NBP inflation target (2.5% YoY). The GDP forecast for 2019 was revised up from 3.6% to 4% YoY, and the estimate for 2020 from 3.4% to 3.7% YoY. For 2021 the NBP expect benign moderation to 3.4% YoY. Surprisingly, according to the policy statement effects of the new government propositions were included in the forecasts. J.Osiatyński stated that in his opinion the impulse could be stronger than NBP projected. 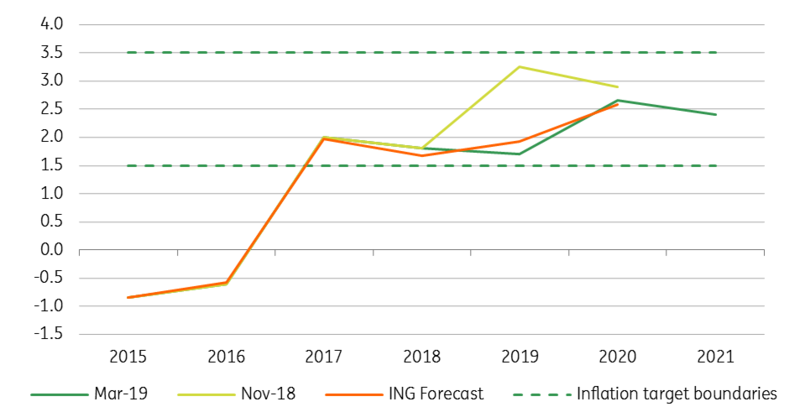 Given the limited risk of inflation increasing above the NBP target and benign moderation of activity in the new projection, we expect the MPC to maintain flat rates in 2019 and 2020.